Following Sunday’s fantastic Alice in Wonderland gig at Hoochie Coochie it was back to business at the Millstone. 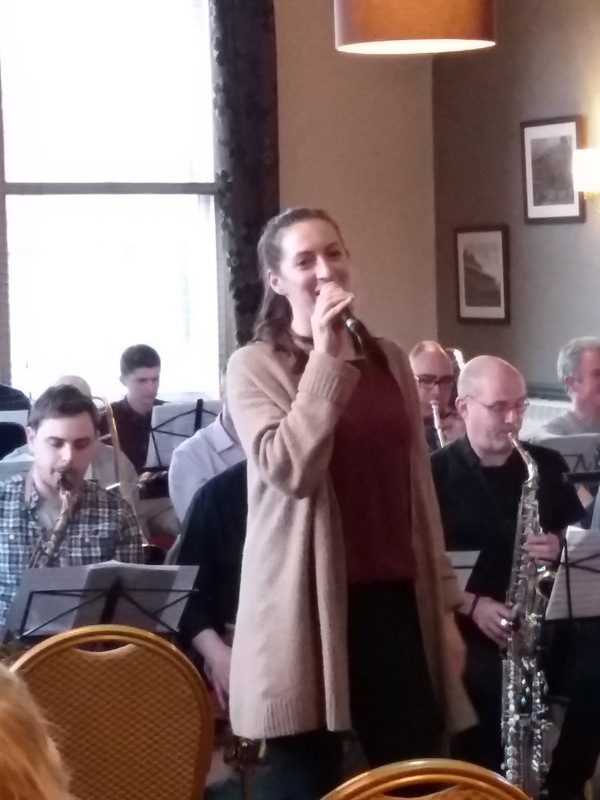 The Strictly Smokin’ Big Band’s monthly public rehearsal night took its usual form of running through a few charts (playing one of them twice) and, during a short interval, running to the bar to refill a glass. Three deps in and one short in the trumpet section, it was definitely a case of back to business. Not Just a Date (comp Ole Frimer) sang Alice Grace with a rare baritone saxophone solo by Laurie Rangecroft, and our superstar vocalist, heard to great effect this evening (the PA, for once, helping not hindering the band’s vocalists), stayed on her feet to sing Jeepers Creepers accompanied by a fired-up Graham Don. Mr D had forgotten his sustain pedal and his sterling efforts impressed fellow bandmates…praise indeed! F’reez was in the building. Back from wherever our man got down to business singing two numbers either side of an instrumental arrangement of Beautiful Love…take one. Being a rehearsal night the idea of a second take isn’t that unusual. This first run through featured the trombone of Mark Ferris. F’reez’s second number – Oasis’ Wonderwall – closed the first set. Many big bands play the chart-topping number and the SSBB isn’t any different. Second set, Beautiful Love take two. And at its conclusion MD Michael Lamb declared this second effort to be ‘marginally better.’ MDs can be hard taskmasters! Sunday’s show-stopper, well, one of many, got another airing as Alice Grace sang Mean to Me with Paul Gowland chipping in on tenor. Hearing it again for the second time in five days made the trip to the Millstone worth the effort, and, to top it, Graham Don and Alice Grace held the audience spellbound with a magnificent opening to Lush Life, the band poised, Jamie Toms’ tenor solo the icing on the cake. 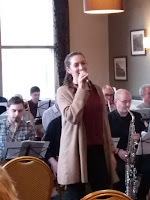 The band’s reeds section is one of soloists – the tenors of Gowland and Toms, and the altos and flutes of Steve Summers and Keith Robinson with the former, Summers, adding clarinet to an arresting arrangement of Caravan. Oh, mustn’t forget the occasional ‘bottom end’ contributions of Mr L Rangecroft. It Had to be You sang F’reez. The Strictly Smokin’ Big Band’s rehearsal night was all but done. All except Stan Kenton’s arrangement of Harold Arlen’s Between the Devil and the Deep Blue Sea. At its conclusion, the depleted trumpet section – Pete Tanton cried off late in the day – hit the high Cs. The obvious conclusion was that the depping Alastair Lord hit the heights, but no, MD Lamb was at pains to point out that the credit should go to Billy Bradshaw. Duly noted. Michael Lamb thanked all for coming along on the evening, thanked the three top class deps, and, in an unintentionally comic moment, thanked trombonist Keiran Parnaby for driving all the way from Cardiff. The band, unimpressed, quick as a flash, as one, said: He doesn’t live there, you know!